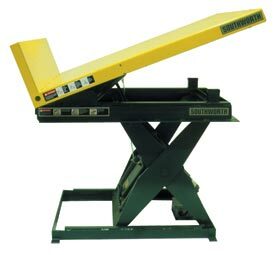 Please call 1-800-826-4554 or email info@nullingallsconveyors.com to contact one of our engineering staff members about your specific lift & tilts requirements. 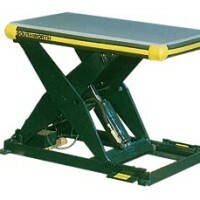 This 2,000 pound capacity hydraulic lift table is built for years of trouble free service. 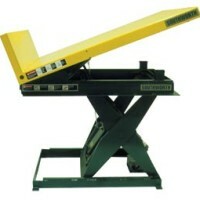 It features an ergonomic comfort edge with high visibility safety yellow striping. 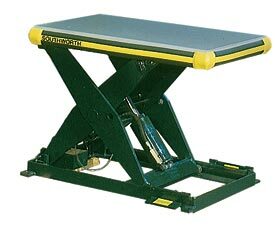 A Lift and Tilt Table allows workers to control of lift table height and tilt angle independently of one another allowing for precise positioning of containers and other loads for optimum worker comfort. 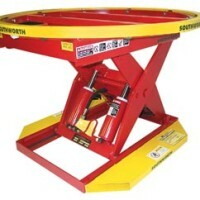 Choose from a variety of platform sizes and tilt angle of 30 or 45 degrees.